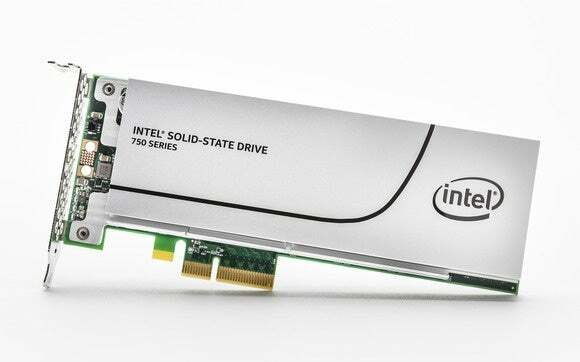 They’re here: Intel’s 750 series SSDs—scintillatingly fast NVMe (Non-Volatile Memory express) storage for the masses. At least, the enthusiast subset of the masses—the infrastructure to support this advanced storage technology is found only in high-end PCs. But the 750’s are fast, and that’s with a capital ‘F’ in certain benchmarks. The 750 series SSDs are so cutting-edge, the first people to enjoy this speed will have very special PCs, indeed. Do you have some paper and a pencil? Are you sitting down? Here’s what it’s gonna take. The 750 series ships in two form factors: a half-height, half-length PCIe expansion card that uses a x4 PCIe slot, and a standard 2.5-inch model. While the latter may look like your typical 2.5-inch SSD, it actually uses the new SFF (Small Form Factor) 8639 connector designed especially for that technology, as well as SATA Express. Your PC undoubtedly lacks a SFF-8639 connector, but you can still use the 2.5-inch drive if you have a somewhat more common M.2 slot, albeit with a slight performance penalty. You’ll need the SFF-8639 to SFF-8643 (mini SAS) cable Intel provides, plus a SFF-8643 to M.2/SATA power connector adapter provided by your motherboard manufacturer. The SATA power connector must be used, because M.2 doesn’t provide the 12-volt rail required by the 750 series. NVMe SSDs operating at higher frequencies require a lot more juice than 600MBps SATA SSDs. The 2.5-inch version of the 750 uses the new small form factor SFF-8639 connector, but may be attached to an M.2 slot using a SFF-8369 to SFF-8643 (mini SAS) cable and an M.2 adapter. You’ll also need an M.2 connection with x4 PCIe 3.0 connections from the CPU to exploit the full potential of the Intel 750 series, or any NVMe drive. Most M.2 connections are Gen 2 PCIe from the chipset, including those wired to Intel’s latest X99. Even if they were Gen 3, the DMI bus feeding the chipset is limited to 2GBps. That’s a significant bottleneck, given that we saw 2.5GBps in certain benchmarks with the expansion card model and have seen reports of 3.5GBps. There’s more: Though anyone with the proper connector can use the 750 series as secondary storage, in order to boot from it, you’ll need a BIOS that supports NVMe. Motherboard vendors could add NVMe capability to an older BIOS, but it might be a financially unsound choice for their mainstream boards, whose users will probably never pine for NVMe. I’m not expecting it to happen with any but the most recent enthusiast systems. Also, while there’s no technical barrier to running NVMe drives in RAID, Intel’s Rapid Storage Technology, which is the RAID on most Intel motherboards, doesn’t support it yet. You could use Windows RAID, but then you couldn’t boot from your setup. And trust us, shorter boot times and Windows performance are a large part of the reason you’d want a 750 series SSD. Because of all the cabling kerfuffle involved with the 2.5-inch drive and the limits of many M.2 implementations, we figure most users will stick with the expansion card drive. Intel might have had the same thought when the company sent us that model to test. Even before we installed the Intel NVMe drivers (Windows 8.1 has its own), we saw 1.3GBps reading and 900MBps sequential writing (4MB) scores in CrystalDiskMark 3. With the Intel drivers, that jumped to 1.6GBps reading and 1.4GBps writing. Small 4KB writes were rated at 229MBps for individual writes and significantly, 832MBps with the queue depth set at 32. Part of NVMe’s magic is its multiple queues. 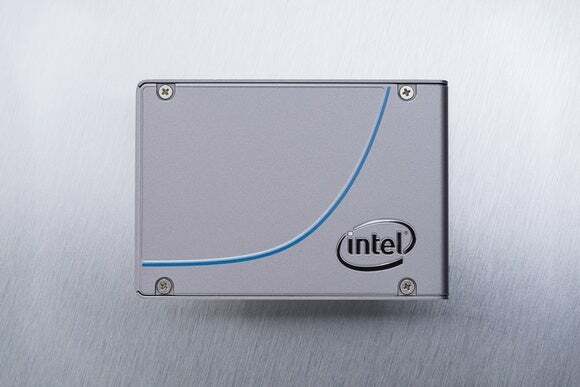 Because Intel was throwing around numbers like 2.5GBps, however, we switched to Iometer. Using Intel’s recommended 128KB file size, we saw just about that. Cool beans. Using a beta version of CrystalDiskMark, it displayed around 2.7GBps. Things were looking 2.5GBps’ worth of fantastic. Then we ditched the server scenarios and headed back down the client-desktop road, where things slowed down again. Most users only pay attention to disk performance when they copy a large amount of data from one place to another. So to back up the artificial benchmarks we copy a large 20GB file, and a 20GB file and folder mix, back and forth. Because NVMe and SSDs are so fast, we generally do this with a RAM disk to eliminate the secondary drive as a bottleneck. Intel’s new 750 series SSD is an enthusiast part and most will want the add-in board rather than the 2.5-inch version that uses a SFF-8639 connector few will have. The best we saw in this ad-hoc testing when reading from the 750 series was 1.5GBps with the large 20GB archive and 1.2GBps with the files and folders. We copied manually, using XCOPY from the command line, and called the Windows file and folder copying routines from a Visual Basic script. Same basic results. Not bad, but not quite as fast as we were expecting. We moved on to PC Mark to see how adding a 750 series would impact overall system performance. Here the 750 series scored quite a bit better than the system running on a single SATA SSD, but it actually lost to the RAID 0 SATA SSD array (two Samsung 840 Pros) that shipped with our Core i7-5960X/X99, 32GB Polywell X9900E4. The score difference of 3,493 to 3,503 is statistically meaningless, but it does show that you can get a lot of bang for your buck from SATA RAID. What exactly was throttling the raw sequential throughput—Windows, the RAM disk, the NVMe drivers, or simply the drive itself—we were unable to ascertain in time for this review. We suspect that part of the story is that, while you’ll see large gains over SATA simply because NVMe is using PCIe, most client usage is relatively straight-line and won’t take advantage of everything NVMe has to offer. Multi-track audio and video editing, transcoding, and the like may see greater boosts than simply copying a single file. On the other hand, while this next comment is subjective as subjective can be, it did seem that Windows operated more smoothly with the 750 series in place. Perhaps it was imagination. Perhaps it was the multiple queues that NVMe provides that make it more efficient when handling multiple I/O requests. We were expecting the 750 to be fast, but we were not expecting it to be affordable. It is, relatively speaking. The 400GB flavor (either type) is $389, and the 1.2TB version is $1,029. That’s expensive by SATA SSD standards, but cheap when you compare it to the nearly $1,000, 480GB OCZ Revo Drive 350, the $500/256GB Plextor M6e, and the $750 MSRP of Kingston’s 480GB Hyperx Predator PCIe SSD. The latter is actually available at a heavy discount, but expect the price of all the Intel 750 series competition to drop real soon. Intel warranties the 750 series drives for five years and for 0.3 drive writes a day. The latter is a new concept from Intel: It means the warranty allows you to write up to 30% of the drive’s total capacity per day without voiding the whichever-comes-first warranty. That’s 133GB per day on the 400GB model, and a whopping 400GB per day with the 1.2GB model—an extremely large amount of data for a non-enterprise drive. Because of the relatively tame performance in some tests and the lack of NVMe support in legacy PCs, we can recommend the 750 series only for the high-end crowd, and then with the caveat that you might get as much dash for less cash with a RAID 0 setup. But the 750 aces server-load scenarios, it’s a single-drive solution, it has a fantastic warranty, and if you have an NVMe-aware BIOS you’re golden. For the average user with an average desktop, SATA RAID or a PCIe/M.2 solution, such as Kingston’s HyperX Predator PCIe SSD, are the preferred, and generally the only practical solutions for increasing storage performance. Not for long, though: Expect big inroads from NVMe in the very near future. A final note: Not all SSDs handle RAID well. Intel’s 735s and Samsung’s 840s do, but it can be hit-and-miss with other drives. Look for a story on that soon. The industry's first consumer NVMe SSD shows what can happen when you leave the SATA and SAS busses behind. You can use it in any PC, but to boot from it requires an NVMe-aware BIOS which is currently (4/2/2015) a very rare thing outside of the enthusiast space.